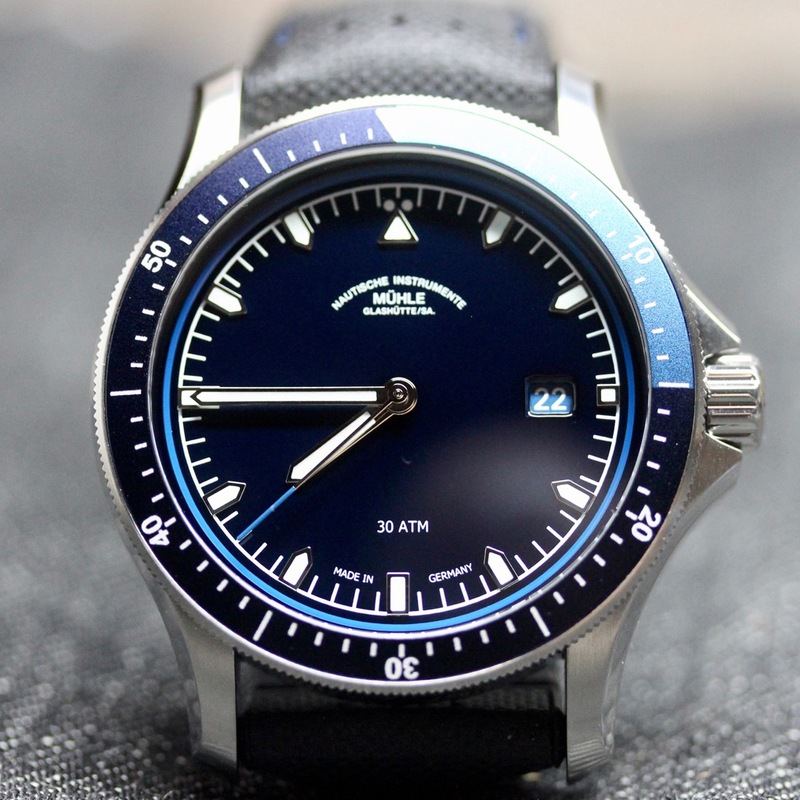 For whatever reason, Mühle Glashütte is a brand that slips off of my radar. Which is crazy, because every time I’ve had one in for review I’ve come away mightily impressed. While those prior hands-on experiences had me encountering things I enjoyed as I wore the watch, the Mühle Glashütte ProMare Go was a winner – for me – right from opening the box. As long-time readers will attest, my favorite color is blue. And I think the only way for the Mühle Glashütte ProMare Go to get any more blue would be on the strap, or perhaps some sort of coating on the case. Not that I’m saying they should, there’s a righteously good amount of blue on this already. Obviously, you have it on the two-tone bezel (different hues of blue) and on the contrast stitching on the strap. The dial has a few shades of blue awaiting your eyes as well. Most noticeably, it’s on the wide, glossy expanse of the dial. This is a deep, inky blue that almost verges on black. Then, you’ve got the color-matched date wheel, which is a slightly different shade. Finally, you’ve got a lighter blue ring on the outer edge, where the dial meets the case. Oh, yeah, and on the tip of the seconds hand! So, if you’re like me, and can’t get enough blue, then this is a watch for you. Now, with all of that blue – primarily in darker tones – legibility might be a concern. Well, maybe on other watches. You see, the indices and hands of the Mühle Glashütte ProMare Go have a super high polish to them. Even in low light, they catch the rays and reflect them right back out, making picking out the time a snap. Drop the lights, and then the SuperLuminova kicks in, again allowing you to tell the time. Now, as far as dive watches go, I suppose the dark tones of the Mühle Glashütte ProMare Go aren’t going to be the most helpful for underwater visibility. Then again, it’s not technically a diver, as the bezel is bi-directional. However, if you’re going to try it, you’ve got a 30 BAR water resistance rating to help you out. For us desk divers, it’s just a good looking piece. The 42mm steel case alternating brushed and polished surfaces, and at only 12.3mm thick, this is a watch that will go with you anywhere. I even managed to pair it up with a suit and it worked quite well. Which is odd, when you consider that the strap is primarily rubber. The specs list it as a combo leather/rubber, but the upper surface has more of a sailcloth feel to it. Regardless, it doesn’t look like rubber, and has a rather nice feel. The reverse side of the strap, just check that out. With all the notches and grooves, you’ve got a double benefit. First up, it helps the strap to be super flexible, and secondly, it allows for a lot of airflow under it. I know, I’m wearing it in winter, but this should help keep sweat reduced some in warmer temps. Would I wear it? In case it wasn’t clear – yes! What I’d change: Hmm. Perhaps a bracelet option? Previous articleIt’s not a pros and cons list – it’s the Horologicon! Come on Patrick, do a proper review. There’s just too many shaded of blue here. Date wheel should be the same color as the dial, and that light blue right around the edge of the dial is just too much. $2,100 is just too much for an SW200 (despite the modifications).